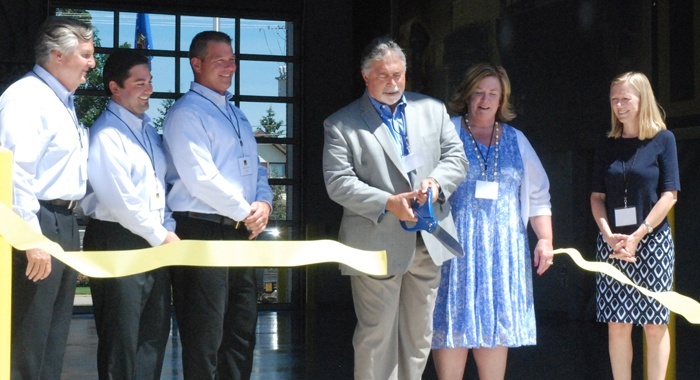 About 350 people attended a ceremonial ribbon cutting at the company’s Ramsdell St. location Friday, June 17. Those present included local, county and state officials, as well as elected officials, featuring remarks from Wisconsin Lt. Gov. Rebecca Kleefisch and Congressman Reid Ribble. The new corporate headquarters is more than just a building; it embodies the persona of Marion Body Works. Large format graphics and murals throughout pay tribute to the company’s history, leadership, and dedicated employees. Ignacio’s wife, and Marion Body Works co-owner Nancy Ignacio, and a team of Marion leaders oversaw every detail of the project. The 19,000 square foot headquarters feature two large customer conference rooms with roll-up doors to showcase client vehicles during the production process, corporate offices, four state-of-the-art conference rooms, and the ‘1905 Café’, an employee cafeteria featuring tables and work stations that face large windows overlooking the patio. Upgrades to the Marion Body Works Campus also come on the production side with a 42,000 square foot expansion to the existing 183,000 square foot production and warehouse facility. Through the hard work of its architect and construction partner, Appleton-based Consolidated Construction Co., Inc., Marion Body Works moved into the new facilities in less than nine months from the project groundbreaking in August 2015.